Roger and Anita live happily in London with their Dalmatians, Pongo and Perdita, stalwart dogs devoted to raising their puppies. Everything is quiet until Anita’s former classmate, the monstrous Cruella De Vil, plots to steal the puppies for her new fur coat. 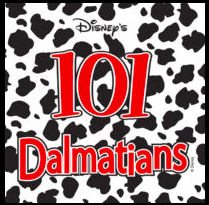 The Dalmatians rally all the dogs of London for a daring rescue of the puppies from Cruella and her bumbling henchmen.